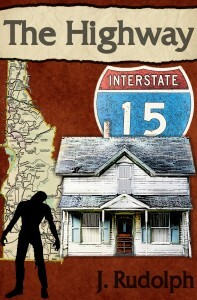 The Highway is the second book in The Reanimates Series. I’m in love with the feedback that has been coming my way! I hope you enjoy the reviews as much as I did! I loved the first Reanimates book, and I enjoyed the second even more. I have to give a pat on the back to the author for writing a story about decent people trying to survive during the zombie apocalypse. J. Rudolph did a great job creating characters that you really want to thrive. The first book leaves off with a group of survivors that are forced the leave their homes. The Highway picks up where the first book left off, with Cali and the gang fleeing for their lives. I don’t want to give away any of the plot, but I’ll just say that things get really exciting, with nail-biting action, lots of zombie slaying, and a creepy cult!! The author knows a lot about survival techniques, and this book includes loads of information that will help you survive when the zombies invade (it’s gonna happen! ).I really loved the ending of The Highway, and it definitely left me wanting more. I can’t wait for the third book to be published so I can find out what happens to Cali and the gang! Thanks J. Rudolph, for writing such an uplifting zombie book! Picks up right where BOOK one left off. It also can be a stand alone novel for those who didn’t get to read bk 1. Great suspense filled expenses and even with some fighting in it there isn’t all of the gun and ammo talk like many of the other zombie and SHTF books have. Hope there is a book 3!! I love the characters and can’t wait to see where the author takes them next.